One of the things I love about Walt Disney World Resort is there is something for everyone. Whether you’re 2 or 102, you can have fun at Disney. And while there are all kinds of activities for children, sometimes the littlest Mouseketeers may feel they miss some of the magic. After all, height restrictions on many attractions leave them out of some of the most popular experiences. But did you know there is an activity that is ONLY for little ones? 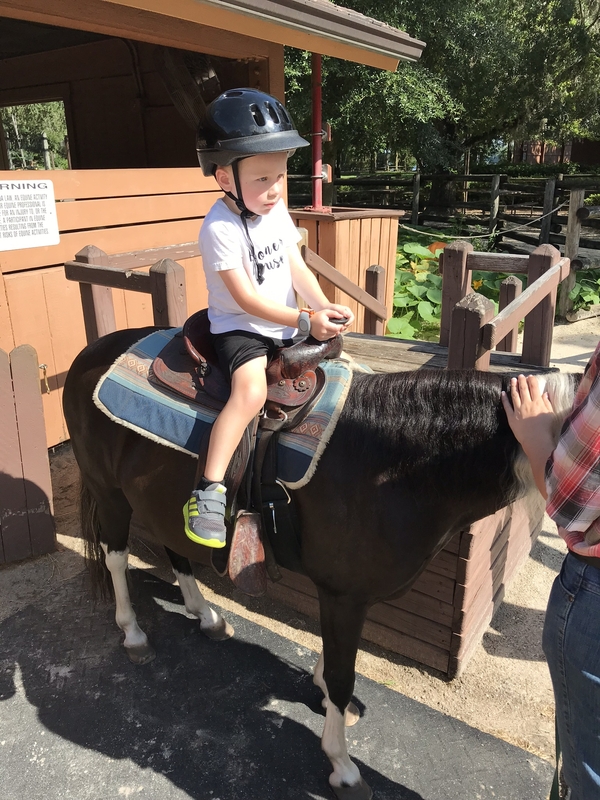 Children who are at least 2 years old, under 48”, and less than 80 pounds can take their very own pony ride! While the “big kids” are off riding coasters, soaring around the world, or getting a princess make-over your tiny cowpokes can be enjoying something special JUST FOR THEM! 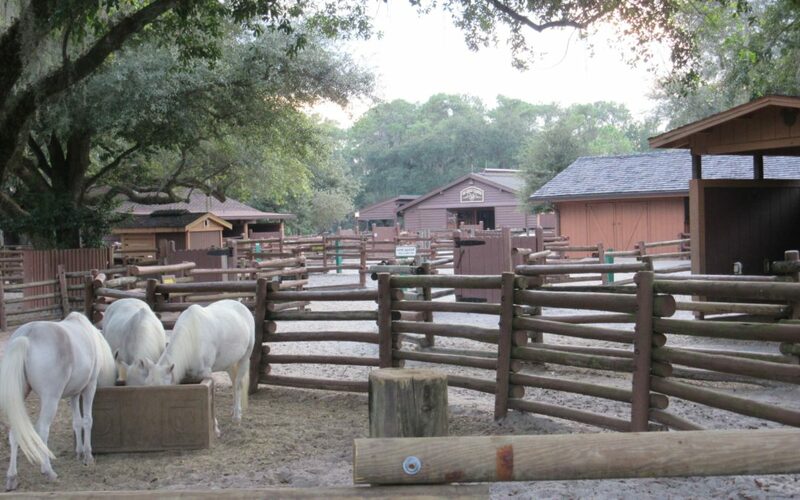 You will find Disney’s petite ponies at Tri-Circle-D Ranch near Pioneer Hall at Disney’s Fort Wilderness Resort & Campground. If you are using Disney transportation, remember busses do not run from resort to resort. If you’re staying at a Disney resort, you can take a bus to a park or Disney Springs, then transfer to a bus going to Fort Wilderness. If you’re at Magic Kingdom, you can also take a boat to Fort Wilderness – our family’s favorite form of transportation! 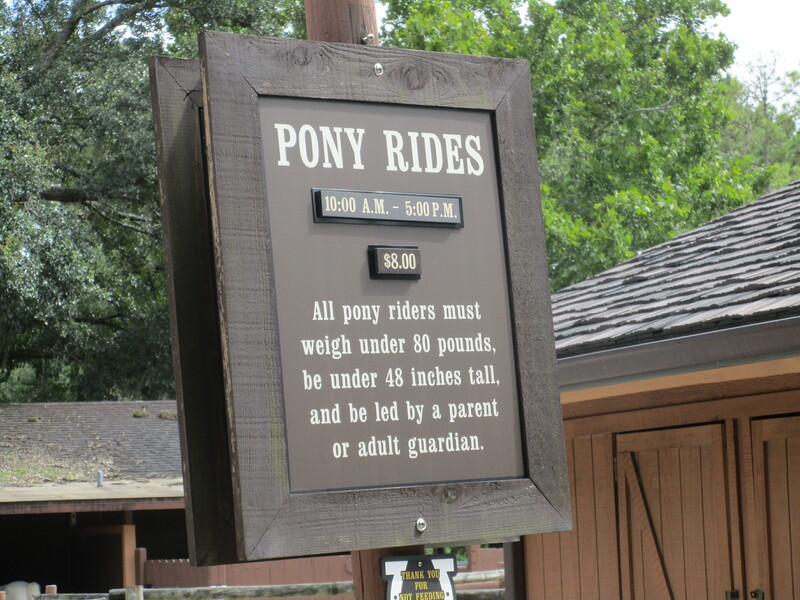 Pony rides take place daily from 10:00 am until 5:00 pm, but the last ride of the day begins at 4:30 pm. You don’t need a reservation – another bonus when dealing with little ones. You can just choose a day and time that works in your child’s schedule and show up for your ride! We saw at least 3 ponies, so you probably won’t have to wait too long once you arrive. Your child must be able to hold on, and closed toed shoes are strongly recommended. The cowhands will have your child stand under the height bar to be sure they meet the size requirement then fit your little one with a safety helmet. 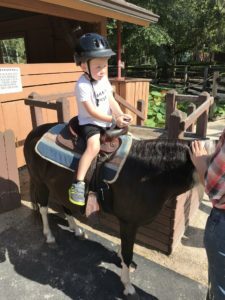 Your child may be more comfortable with long pants so the saddle doesn’t irritate their legs, although my grandson wore shorts and did just fine. A parent or guardian must lead the pony at all times. The ride follows a clearly marked path which winds through the corrals. Although the adult leads the pony, it’s really the pony who sets the pace. Rides are about 5-10 minutes long depending on if the pony needs to stop to “take care of business” or just enjoy the sights. It’s the perfect length for little cowpokes! Diva Tip: If you want some great photos, be sure to have a third person with you to play photographer. My husband and grandson went alone while my granddaughter and I had some “girl-time,” and it was a little tricky getting photos while also leading the horse. 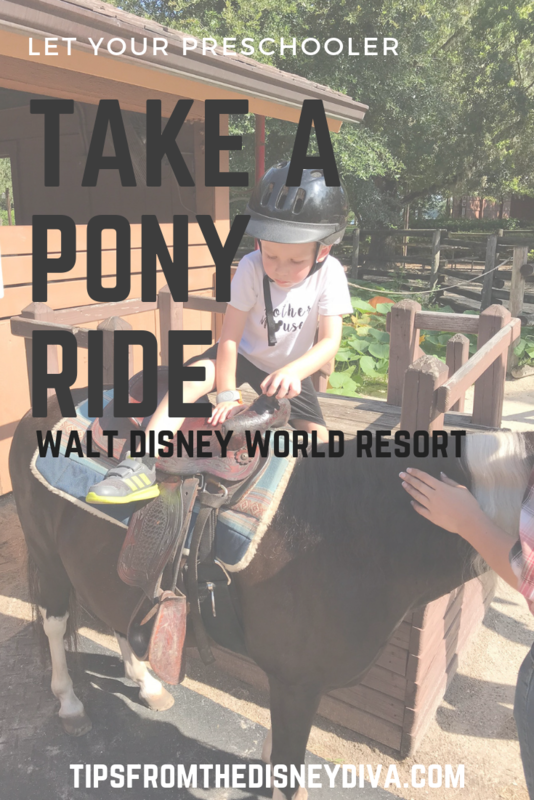 One of the most magical things about the pony ride is how affordable it is! While we’re accustomed to Disney pricing, (or should I say “overpricing”?) this fabulous fun is a modest $8! Just be sure to bring cash as it’s the only form of payment accepted – Credit cards, gift cards, or Magic Bands are NOT accepted here. When you’re finished with your pony ride, take some time to enjoy visiting the other horses at the Ranch! You may even see Cinderella’s horse! Or if other family members want to “horse” around, you can call(407) 824-2832 for information about Tri-Circle-D Ranch’s other offerings, including horseback trail rides, wagon rides and private carriage rides. And if you’re ready for some grub after your pony ride, check out Hoop-Dee-Doo Musical Revue (our grandkids LOVED this! – Read Cruisin’ Diva’s review here) or Trail’s End, one of Pixie Dusted Diva’s favorite. 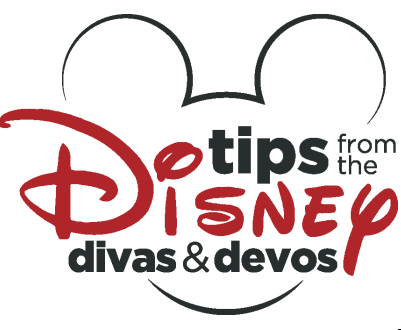 Are you ready to plan your visit to Walt Disney World Resort? Let Patricia at All for Dreams Travel answer all your questions and book your perfect trip! Best of all – her services are FREE! Take a Ride in a “Minnie” Van at the Walt Disney World Resort!